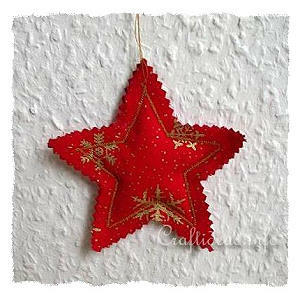 Create lovely fabric Christmas tree ornaments using leftover Christmas fabric. Your stars can look elegant by using a fabric with a touch of gold or you can create stars with more of a prim look by using homespun fabric. 1. Print out the star patterns and create permanent templates by following this tutorial. 2. Cut out two identical squares larger than your star shape. Pin the 2 wrong sides of your squares together and trace the star shape in the middle of the square. Sew along the traced line leaving one side open. Stuff batting inside the opening and then sew it also closed. 3. 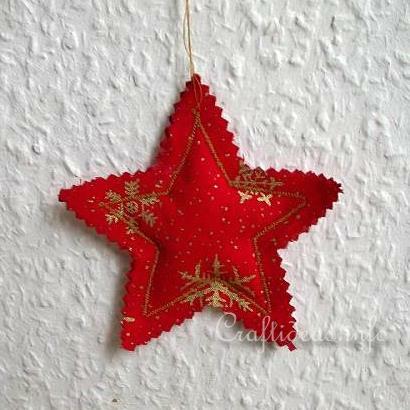 Cut out around the star with a centimeter border using the pinking shears.